The chapter begins with the words, “I have seen the future, and it works!” Basil has written a blurb for his paper about the “Rocket Boys,” in which he praises their ingenuity and courage. Basil is praising the Rocket Boys for their all-American ingenuity during the Cold War, so it’s ironic that the phrase he quotes is usually attributed to Walter Duranty, the journalist who visited the Soviet Union in the 1920s and came back singing its praises. Homer begins the 11th grade in the fall of 1958. Right away, he notices that school feels different: the football players seem sullen and annoyed, without any of the magnetism that made them popular with the girls last year. Another major change is that classes have become much more difficult: teachers write more on the blackboards, assign more homework, and require more books for their classes. The influence of the Cold War on life in Coalwood is apparent here again. The federal government’s efforts to increase funding for education have resulted in more homework and more difficult classes for Homer and his friends. Between classes, an attractive girl asks Quentin and Homer if they’re going to the school dance over the weekend. She doesn’t pay any attention to the football boys. Shortly afterwards, Homer sees Valentine. She asks him to walk her to class, and he obliges. As they walk, she tells Homer that she read about him in the newspapers, and that a group of girls is eager to watch the BCMA build rockets. Homer is excited and aroused by Valentine’s flirtations. One unexpected consequence of Coalwood’s new emphasis on math and science is that Homer and his friends start to seem more attractive to girls at school. Homer’s experiments with rockets have gotten him a lot of unwanted attention, but his impressive rocket launches (and, perhaps, Basil’s fawning articles), have now made him something of a town celebrity. At the end of the school day, Homer sees Dorothy outside. She asks him to come over on Sunday for studying, and adds that she’s missed him all summer. As they talk, Roy Lee comes up to Homer, looking at Dorothy with distaste, and tells Homer to get on the bus. Homer’s love for Dorothy seems guaranteed to disappoint. Dorothy clearly likes Homer as a friend, but doesn’t show much interest in him romantically. Roy Lee’s advice for Homer is harsh but realistic. Although Homer has never been an outstanding student, he finds that he’s excelling at plane geometry, in part because it’s highly relevant to rocket science. Mr. Hartsfield is the plane geometry teacher, and he seems impressed with Homer because Homer asks difficult questions. He reminds Homer that he needs to learn about mathematics one step at a time—he needs to master basic algebra and geometry before he can be a rocket scientist. Homer is pleased to learn that, when he has a genuine interest in the subject matter, he’s an excellent student. Homer’s instinct, here as before, is to rush forward with his pursuits. It’s the job of calmer people—like Quentin and Mr. Hartsfield—to slow Homer down and encourage him to proceed “scientifically.” It’s inspiring to see Homer succeeding at school, now that his love for rocket science has given him a reason to study hard. On Sunday, Homer goes to Dorothy’s house to study, and she embraces him warmly for helping her study. Homer tries to “make a move” by putting his hand on her shoulder, but she wriggles free. This starts a pattern over the next few weeks: Homer comes over to help Dorothy study, tries to get her to kiss him, and never quite succeeds. Homer notices that Dorothy is far better at math than he is. Homer keeps getting mixed signals from Dorothy. He also realizes that she’s better at math than he is, and yet she is never considered as a possible member of the BCMA. The BCMA is a “boys’ club”—sexist on a relatively innocent level for now, but also representative of the gender inequality especially prevalent in the sciences. Homer becomes so fascinated by plane geometry that he comes to believe that math is a “message from God.” He goes to Reverend Lanier, hoping to tease out his complicated thoughts. When he explains himself to Lanier, Lanier is skeptical—all of God’s message, he insists, can be found in the Bible. Dissatisfied, Homer goes to talk to Reverend Richard. Richard is similarly reluctant to include mathematics in “God’s plan.” Nevertheless, he acknowledges that the “Number” is also a part of God’s plan, along with the “Word.” Unexpectedly, he gives Homer some advice. If Homer succeeds in launching a rocket, he insists that Homer mustn’t let the prestige go to his head. Rather, Homer needs to remember that God is his master. Throughout Rocket Boys, Hickam reminds us that Homer lives in an intensely religious community. At the beginning of the book, Homer is uncertain about his relationship with God, but here he begins to “feel God” in mathematics and science. Although few people in Coalwood understand this process, Homer begins to embrace God and faith through science, rather than in opposition to it. Reverend Richard’s advice foreshadows Homer’s conflicts with his friends and family in the coming chapters. The BCMA develops a new method for launching rockets from a distance. O’Dell borrows a car battery from his father, and uses it to heat rocket fuel. Because O’Dell doesn’t return the battery, word gets out that the “Rocket Boys” steal everything—and soon Homer finds himself blamed for every theft in town. One weekend, the BCMA finds an abandoned barn in Cape Coalwood, which is filled with old telephone wires that were used in mines. Thinking that the wire and metal could come in handy, the boys decide to take them. Although the people of Coalwood are gradually growing more supportive of the Rocket Boys, they sometimes regress to their old suspicions—here accusing them of stealing everything in town, due to a simple misunderstanding. Hickam continues to enjoy showing the reader how Homer and his friends obtain the raw materials for their rockets—there’s something adventurous and mischievous about these descriptions. One day, Tag Farmer, the town constable, calls Homer and tells him that he needs to come to Mr. Van Dyke’s office immediately. Homer goes to see Van Dyke, who’s sitting with O’Dell and Roy Lee. Van Dyke explains that the BCMA has been stealing from his mining company, breaking and entering, etc. He suggests that the boys could do jail time for stealing his telephones—a suggestion that naturally terrifies the boys. Van Dyke calmly offers to sell the BCMA his telephones for 35 dollars. The BCMA agrees to pay off their debt, keeping the news hidden from their families. After leaving Van Dyke’s office, Roy Lee says that he’s finished with building rockets—it’s more trouble than it’s worth. Even though the BCMA is terrified by its meeting with Mr. Van Dyke, it’s hard to tell how seriously we should take Mr. Van Dyke’s accusations. He seems to be enjoying torturing the boys, deliberately drawing out his words as he describes their punishment. (The fact that he tells the boys not to talk about the theft with their families seems doubly suspicious.) It’s entirely possible that Van Dyke dislikes the BCMA and wants to discourage any further rocketing, or at least wants to make a little free money. Meanwhile, Homer continues with his studies. He has long hours of homework, during which his only companion is his cat, Daisy Mae. Miss Riley’s chemistry class is particularly challenging to him. One day, Miss Riley shows her class what happens when potassium chlorate and sugar combine: there’s a bright green flame. Homer and the other members of the BCMA realize that they could use these chemicals as rocket fuel. Afterwards, Miss Riley, who’s noticed Homer’s interest, asks him if he’s thought more about joining the science fair. Homer replies that he doesn’t think the BCMA is ready for competition yet, but he asks her for help with designing rocket fuel. Miss Riley suggests that potassium chlorate is too unstable to use for fuel, but she promises to research rocket science for Homer. She asks Homer, sincerely, why he’s interested in building rockets. Homer, surprised to be having such a frank conversation, admits that he can’t explain his love for rockets. Miss Riley nods, saying that she gets the same indescribable thrill from writing poetry. Miss Riley is an important ally and friend to Homer—like Jake, Elsie, and Mr. Bykovski, she believes that he can succeed if he puts his mind to it. 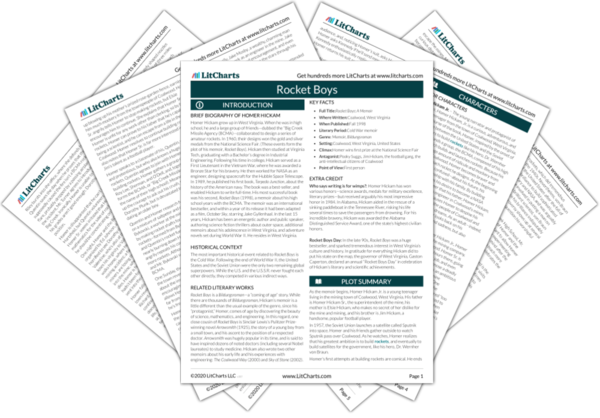 Miss Riley’s science experiments inspire Quentin and Homer to pursue new kinds of rocket fuel, in order to build the most fuel-efficient rockets possible. Many of the characters in Rocket Boys turn to creative pursuits for peace and happiness, like Elsie with her painting, and Miss Riley with her poetry. These “creative pursuits” seem highly gendered, however: Homer, as a boy, turns to a public, scientific, and even violent activity, while Miss Riley and Elsie express their creativity privately and quietly—in essence, keeping it to themselves. Later, Quentin suggests that for fuel, the BCMA use a combination of saltpeter—a more stable molecule than potassium chlorate—and sugar. Homer tests the mixture, and finds that it yields flame, gas, and heat—the three vital ingredients for rocket propulsion. Homer Sr. notices Homer’s experiments, and, much to Homer’s surprise, compliments him for his studiousness. Homer is showing progress with his studies and his rocket building, and here he surprises himself by thinking of a new, powerful fuel source. The confirmation of Homer’s progress comes through the lips of Homer Sr., who, for once, compliments Homer for his work. Although Roy Lee has been irritated with the BCMA after the telephone incident, he decides to stay in the group. Meanwhile, a boy named Billy, another high school student, joins the club. Billy is the son of an unemployed former miner, and when Elsie sees him, she provides him with Homer’s old clothing. Many of the characters in Rocket Boys criticize Homer for being the spoiled son of a mining superintendent—he has the money to spend on rockets because he comes from a wealthier family than most of his peers. Yet everything is relative, and Homer is still much poorer than any of his rivals in the science fair, as we will see. The BCMA proceeds with its Auks. Auk X uses the new fuel—saltpeter and sugar—but it doesn’t launch because the fuel, which the group dubs “rock candy,” is packed in too tightly. Auk XI fairs better, but the fuel gets “clogged” at the nozzle, meaning that there’s no net propulsion. Sherman proposes a dangerous tactic: melt the rock candy slightly before packing it into the rocket shaft. Homer is reluctant to do so, since this could mean blowing himself up. Eventually he relents and decides to try it, in the hope that it will yield a more efficient fuel. As Homer proceeds with his rockets, he’s inevitably forced to face some danger. Hickam ends this chapter with a description of some upcoming peril, adding suspense to the narrative. Given that Homer has already blown up a fence with his fuel sources, there’s no telling what he’ll do with his rock candy. Arn, Jackson. "Rocket Boys Chapter 10: Miss Riley (Auks IX-XI)." LitCharts. LitCharts LLC, 20 Nov 2015. Web. 21 Apr 2019. Arn, Jackson. "Rocket Boys Chapter 10: Miss Riley (Auks IX-XI)." LitCharts LLC, November 20, 2015. 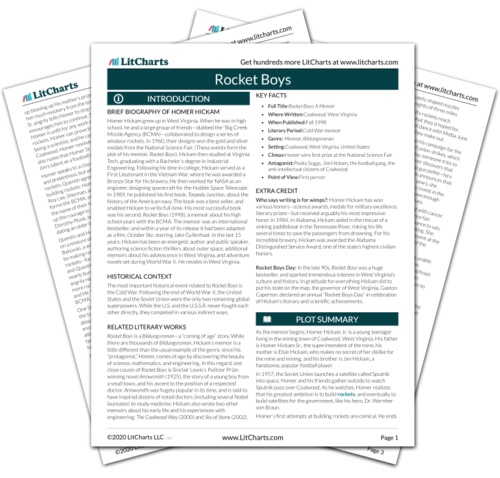 Retrieved April 21, 2019. https://www.litcharts.com/lit/rocket-boys/chapter-10-miss-riley-auks-ix-xi.